Part 1 of a series on Rotterdam's efforts to become a sustainable and "climate-proof" city. Evening view of Rotterdam skyline and waterfront with the suspension cables of the city's emblematic Erasmus Bridge illuminated against the sky. Rotterdam, the Netherlands--Although it is committed to reducing its greenhouse gas emissions, Rotterdam--the Netherlands' second largest metropolis--no longer tries to rally the public behind its carbon dioxide reduction goals. "It's a very deliberate political decision," said the city's climate program director, Paula Verhoeven. The city focuses instead on air quality, noise pollution, energy efficiency and other measures of sustainability. "There is no target on CO2 emissions at the moment," Verhoeven said. "When you talk to the public about CO2 emissions, it doesn't appeal very much. . . it's very abstract," she said. Instead, the city talks about making its buildings, industries, and transport systems cleaner and more energy efficient. "Of course," added Verhoeven, "we do have a target on all these other things that we do, and we thereby reduce our level of CO2 emissions. "People want a clean environment, Verhoeven said. "They want healthy air quality. They want low-energy bills. They want a green city. They want affordable houses. They want nature in their city. Those are all elements that help in fighting climate change and in making Rotterdam a more sustainable place." The city is endeavoring to create a low-carbon economy by focusing on three sectors: industry, the built environment, and transportation. The industrial sector is the city's most CO2-intensive. In 2010, it produced 88 percent of the city's CO2 emissions. Before the city opted to stop highlighting its CO2-reduction goals, its plan was to cut CO2 emissions 50 percent below 1990 levels by 2025, and the city is still quietly planning to achieve that goal. In addition, a Covenant of Mayors that the city signed in 2009 requires that 20 percent of the energy the city produces must come from renewables. •	by capturing and storing carbon (CCS). The combination of the city's concentration of energy-intensive industry and the presence of empty oil and gas fields just offshore in the North Sea is ideal for a major CCS demonstration project. A consortium of 11 Rotterdam businesses is developing a regional CCS pipeline that will link industries producing lots of CO2 to potential offshore CO2 storage facilities. Known as the Rotterdam Capture and Storage Demonstration Project (ROAD), it is one of the world's largest CCS demonstration efforts. Rotterdam might be said to be a city that "makes no little plans." Its goal is to be the most sustainable port city of its kind--pleasant, safe, and healthy, with a flourishing economy. In addition to its carbon storage program, its air quality and noise reduction efforts, and its vigorous promotion of energy efficiency in the corporate and residential sectors, the city is already also boosting its renewable energy production, developing non-fossil fuel feedstocks for its chemical industry, and encouraging the trading and use of sustainable biomass. In Rotterdam's strategic sustainability and climate plan, Investing in sustainable growth, Rotterdam Mayor Ahmed Aboutaleb and Vice Mayor for Sustainability Alexandra van Huffelen declare that by 2042, "Rotterdam . . . will have been transformed into a system of recycling streams of water, energy, raw materials, goods and waste products: a network of information and knowledge, of synergy and vigor..."
"Compared to today, twice as many people will live in the inner city, but the impact on the environment will be minimal. In 2042, Rotterdam will be an attractive city which offers high-quality living, working and mobility." 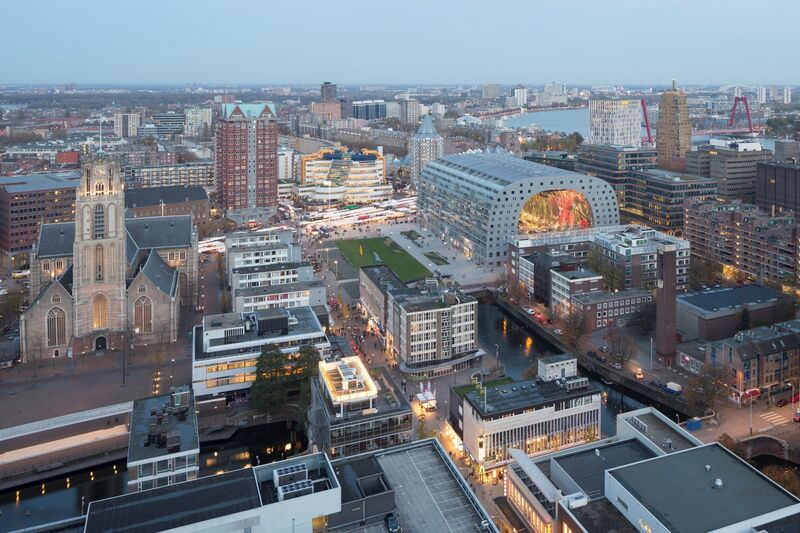 According to the mayor and vice mayor, this vision of next-generation Rotterdam, "fits in with what many of the people of Rotterdam consider to be the most important motivation in their lives: a better future for their children and grandchildren and for future generations. "Our task," the Mayor and Vice Mayor said, "is to ensure that the world is not squandered but is carefully managed and passed on to those who come after us." "For us," they explain, "sustainable development means meeting current requirements without jeopardizing the potential for future generations of inhabitants of Rotterdam." Their goal is to have the people of Rotterdam ultimately "feel much happier living, working, studying and spending their leisure time in a healthier and more child-friendly city." To learn more about how Rotterdam is executing its long-range climate change and sustainability plans, see parts 2-5 of our ongoing series of articles on the city's sustainability efforts.